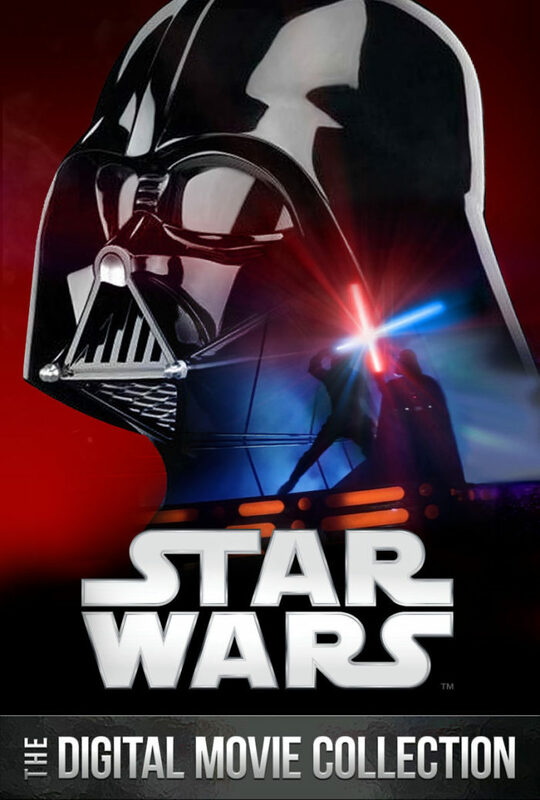 Star Wars Digital Edition Hitting April 10th Loaded With Additional Bonuses - Are You Screening? As the world prepares to completely lose its mind with the release of the new Star Wars film, it is obviously time to try to stir the pot as much as possible. That in mind, the previous films from the franchise are going to be released on April 10th in digital edition, and with some new bonuses to help sucker you in to the purchase. They also come with the legacy bonus content, and put together, these are impressive releases. I don’t want to overly comment on how many sales the first three episodes are going to get, but if you need to catch up on the universe in general, this is your chance. And, since we’re looking at a new generation who need to get on board for the new film, this is the way to go. Take a look at all the bonus potential below, and catch a trailer for the release. Conversations: Doug Chiang Looks Back (Documentary)- Design Director Doug Chiang provides a look at Star Wars conceptual drawings and models and reveals the lessons learned from George Lucas that helped him create some of cinema’s most lasting and iconic images. From preproduction, principal photography and postproduction to the opening night of Episode I, this documentary gives an insider’s look into how one of the most anticipated movies ever was created. The Podrace: Theatrical Edit- The original theatricial edit of the Episode I Podrace. Bail Organa Of Alderaan (Deleted Scene)- Adrian Dunbar was cast as Bail Organa for this brief appearance in Episode I. After the role was cut, the role was recast in Episode II with Jimmy Smits as Bail. Complete Podrace Grid Sequence (Deleted Scene)- The complete podrace grid sequence includes characters cut from the final version of Episode I.
Anakin’s Scuffle With Greedo (Deleted Scene)- Qui-Gon breaks up a fight between Anakin and Greedo. Trash-Talking Droids (Deleted Scene)- As the Jedi arrive at the Naboo blockade, these trash-talking Trade Federation droids remark upon their presence. Anakin’s Return (Deleted Scene)- After destroying the Droid Control Ship, young Anakin returns his “borrowed” Naboo starfighter to a group of incredulous pilots. Battle On The Boarding Ramp (Deleted Scene)- Qui-Gon Jinn’s escape from Darth Maul on Tatooine was not as easy in this first iteration, which has the duel continue aboard the fleeing Naboo starship. Extended Podrace Lap Two (Deleted Scene)- In the extended version of Lap Two of the podrace, watch salvage droids clean up a podracer wreck, Teemo get hit in the face with a bug and Tusken Raiders shooting at Jawas. The Waterfall Sequence (Deleted Scene)- Qui-Gon, Obi-Wan and Jar Jar need to act fast when their inoperable bongo starts to go over a waterfall. Conversations: Sounds In Space (Documentary)- Legendary sound mixers Ben Burtt and Matthew Wood meet at Skywalker Ranch to discuss how they came to work on the Star Wars films, share the surprising sounds that made the movies roar to life and celebrate the franchise that defined their careers. Discoveries From Inside: Costumes Revealed (Documentary)- J.W. Rinzler and Laela French look at some of the most iconic wardrobe pieces in cinema history and share anecdotal fun facts about the costumes of Darth Vader, Boba Fett, Han Solo and other fascinating Star Wars characters. “From Puppets To Pixels: Digital Characters In Episode II” (Feature-Length Documentary)- George Lucas and the creative team behind Episode II use digital technology in order to create new characters and re-imagine familiar faces. State Of The Art: The Previsualization Of Episode II (Documentary)- George Lucas, Ben Burtt and artists from Industrial Light & Magic discuss the important role previsualization played in creating unforgettable action sequences from Episode II. “Films Are Not Released, They Escape” (Documentary)- Editor-Sound Designer Ben Burtt and team discuss how sound recordings, ADR, Foley recording and musical elements seamlessly come together in Episode II. Episode II Visual Effects Breakdown Montage (Siggraph Reel)- In this reel of effects footage, you’ll see how Industrial Light & Magic was able to create unforgettable characters and scenes from Episode II using a vast array of techniques. Raid On The Droid Control Ship & Extended Arena Fight (Deleted Scene)- During the Geonosian arena battle, a team of Jedi led by Ki-Adi-Mundi and Plo Koon attempt to deactivate the Droid Control Ship, only to discover that these droids have been upgraded. Cut amid this story is additional action of Jedi battling in the arena. Padmé’s Parents’ House (Deleted Scene)- Padmé’s parents question both Padmé and Anakin about their daughter’s safety, while Padmé’s sister Sola asks her about her relationship with Anakin. Dooku Interrogates Padmé (Deleted Scene)- Padmé requests the release of Obi-Wan from captivity, a request Count Dooku would consider if Naboo were to join the Separatists. Anakin’s Nightmares (Deleted Scene)- En route to Naboo aboard a refugee freighter, Anakin dreams about his mother in danger. Jedi Temple Analysis Room (Deleted Scene)- Obi-Wan visits the Jedi Temple analysis room in order to find out where the dart used to kill the bounty hunter Zam Wesell originated. Obi-Wan & Mace – Jedi Landing Platform (Deleted Scene)- Obi-Wan and Mace Windu discuss the removal of the Kamino system from the Jedi Archives and Obi-Wan’s concerns about Anakin. Conversations: The Star Wars That Almost Was (Documentary)- Jonathan Rinzler and Pablo Hidalgo, historians and writers for the Star Wars empire, reveal how iconic moments and stories from the Saga almost took very different paths – and discover original ideas behind classic characters and quotes. Discoveries From Inside: Hologram & Bloopers (Documentary)- J.W. Rinzler and Monica Chin-Perez enter the Archives to view original work prints for the 35mm hologram of Princess Leia, an early version of the Death Star explosion, a recently discovered blooper reel featuring actors’ flubs and more. “Within A Minute: The Making Of Episode III” (Feature-Length Documentary)- Producer Rick McCallum details the various teams of people and incredible effort involved in creating the epic lightsaber duel between Anakin Skywalker and Obi-Wan Kenobi on Mustafar. The Journey Part 1 (Documentary)- From the final day of shooting to the international premiere of Episode III, the stars and the artists behind Star Wars comment on the conclusion of the saga. The Journey Part 2 (Documentary)- The fascinating journey continues as the film’s cast and crew share their stories of Star Wars’ epic final chapter. ILM Episode III Siggraph Reel (Reel)- In this reel of effects footage you’ll see examples of character and vehicle animation, digital face and head replacement, matte paintings, match-moving and set extensions, miniature environments, and more. Yoda Communes With Qui-Gon (Deleted Scene)- In the script, Yoda makes contact with Qui-Gon Jinn from beyond the grave; Qui-Gon then teaches Yoda the secret of becoming one with the Force. This was cut early enough that Liam Neeson never recorded the dialogue, so only a temporary voiceover exists. Grievous Slaughters A Jedi / Escape From The General (Deleted Scene)- While trying to locate the kidnapped Palpatine, Obi-Wan and Anakin find that Shaak Ti has been captured by General Grievous. After Grievous assassinates Shaak Ti, Obi-Wan and Anakin are forced to flee. Seeds Of Rebellion (Padmé’s Apartment) Deleted Scene- Mon Mothma and Bail Organa discuss the formation of the Rebel Alliance. Padmé suggests that the Jedi be consulted in this matter, but the group decides to take action before involving the Jedi. Exiled To Dagobah (Deleted Scene)- In a heartrending scene, an exiled Yoda arrives on Dagobah. Anakin Kills Shaak Ti (Deleted Scene)- In the first cut of Episode III, Jedi Master Shaak Ti was killed by General Grievous aboard his flagship. In a later edit, Shaak Ti was to be killed by Anakin during the assault on the Jedi Temple. With her death scene cut twice, Shaak Ti was spared. A Plot To Destroy The Jedi? (Deleted Scene)- Yoda, Mace and Obi-Wan discuss their concern over the Chancellor’s increasing powers as well as a plot aimed towards the Jedi. Conversations: Creating A Universe (Documentary)- Longtime collaborators Roger Christian and Joe Johnston meet for the first time to discuss the impact that George Lucas had on their lives and share memories of building the Millennium Falcon and other iconic elements of the Star Wars universe. Discoveries From Inside: Weapons & The First Lightsaber (Documentary)- J.W. Rinzler and Roger Christian open up the hallowed Archives at Skywalker Ranch to showcase classic props created for the Star Wars empire, including the most iconic piece of all…the Lightsaber – plus, the Archives’ latest discovery! Anatomy Of A Dewback (Documentary)- George Lucas reveals how his team transformed the dewback creatures from immovable rubber puppets in the movie’s original 1977 release to seemingly living creatures for the 1997 Special Edition. Star Wars Launch Trailer (Trailer)- In 1977, audiences everywhere were given a further glimpse of a galaxy far, far away…. Tosche Station (Deleted Scene)- George Lucas originally felt it was essential to inject some humanity early on by introducing Luke Skywalker and his friends at the local hangout. As the movie was being edited, Lucas realized that he didn’t need the scene and that it slowed down the action. Aunt Beru’s Blue Milk (Deleted Scene)- Even the blue milk briefly glimpsed during the homestead dinner scenes in Episode IV has developed a following among Star Wars fans. Here is a bit more of Aunt Beru’s famous beverage. The Search For R2-D2 (Deleted Scene)- This footage includes a projected background to make the landspeeder appear to be moving. George Lucas found the finished visual unsatisfactory. Cantina Rough Cut (Deleted Scene)- This version of the cantina sequence was assembled with footage from the initial England shoot. After additional photography in California, new aliens were inserted into the final cut. One notable omission is seen here in a cutaway of Han Solo with a local woman. Old Woman On Tatooine (Deleted Scene)- As Luke rushes into the town of Anchorhead aboard his landspeeder, an elderly local urges him to drive safely. Stormtrooper Search (Deleted Scene)- An alternate version of this scene of stormtroopers searching the Mos Eisley alleyways made it into the final film. Footage from this deleted take found its way into The Star Wars Holiday Special. Darth Vader Widens The Search (Deleted Scene)- This footage of Darth Vader and an Imperial officer includes original production audio — so that is Dave Prowse’s voice coming from Darth Vader. This footage was redubbed and used in The Star Wars Holiday Special. Alternate Biggs And Luke Reunion (Deleted Scene)- In the 1997 Special Edition of Star Wars, this footage was reinserted into the final cut with one important deletion — Red Leader’s passing reference to Anakin Skywalker remained on the cutting room floor. Conversations: The Lost Interviews (Documentary)- Listen to never-before-heard interviews with the cast and crew of Star Wars: A New Hope accompanied by rare, behind-the-scenes footage and pictures. Carrie Fisher, Harrison Ford and others reveal the thrills and challenges of their early days on set. Discoveries From Inside: Matte Paintings Unveiled (Documentary)- Esteemed artist and matte painter Harrison Ellenshaw discusses the nearly lost art of matte painting – an element crucial to the look of Star Wars and so many other classic films – plus, he shares a big find of pint-sized proportions from A New Hope. A Conversation With The Masters (2010) (Documentary)- George Lucas, Irvin Kershner, Lawrence Kasdan and John Williams look back on the making of The Empire Strikes Back in this in-depth retrospective from Lucasfilm created to help commemorate the 30th anniversary of one of the most beloved films of all time. 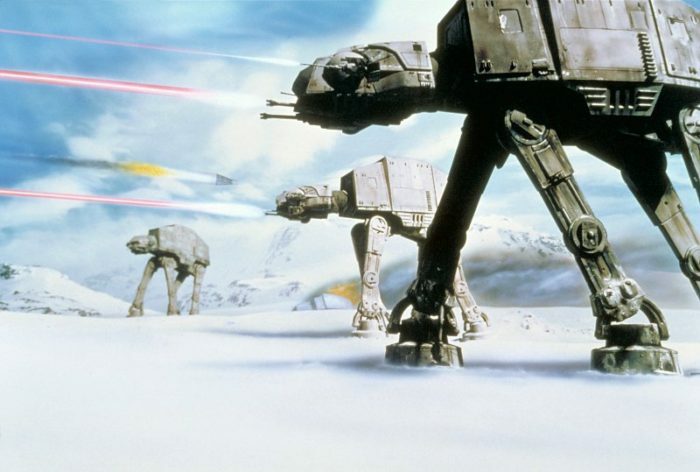 Dennis Muren: How Walkers Walk- Legend Dennis Muren describes the techniques he used to create the motion of the Imperial walkers during the Battle of Hoth in The Empire Strikes Back. George Lucas On Editing The Empire Strikes Back 1979 (Documentary)- In this 1979 interview, George Lucas talks about his views on editing as well as exploring specific editing techniques used in The Empire Strikes Back. George Lucas On The Force: 2010 (Documentary)- George Lucas explores the greater meaning behind the Force, describing in full detail the contrast between the light side and the dark side of the Force. Han And Leia: Extended Echo Base Argument (Deleted Scene)- Though “You could use a good kiss!” proved to be a strong and unforgettable exit line, this first argument between Han and Leia lasted longer. Wampa Attacks (Deleted Scene)- The wampa threat was bigger in the script. After hints that the Rebels are not alone, a beast attacks. The Rebels then trap wampas in specially marked pens, which C-3PO uses to escape Imperial troopers. Unsatisfactory creature effects cut this subplot from the film. Yoda’s Test (Deleted Scene)- As a test of Luke’s Jedi reflexes, Yoda floats a silver bar before the young apprentice. Luke ignites his blade and cuts the bar into pieces, an effect never completed. Hiding In The Asteroid (Deleted Scene)- The Falcon hides inside an asteroid cave, and the lessening thumps of enemy bombardment (realized by simply shaking the camera) lead Han and Leia to believe the Imperials are moving on. Alternate Han And Leia Kiss (Deleted Scene)- In this cut of Han and Leia’s first kiss, it’s important to note that their second kiss happens immediately thereafter, and is initiated by Leia, before the scene is interrupted by C-3PO. Lobot’s Capture (Deleted Scene)- The fate of Lando’s aide is never revealed in the finished movie, but this footage makes it clear that his role in freeing the Rebel prisoners did not go unnoticed. Conversations: The Effects (Documentary)- A team of legendary video effects artists celebrate the technological advances made possible by the Star Wars franchise and share stories, secrets and “happy accidents” from their groundbreaking work on the original films. Discoveries From Inside: The Sounds Of Ben Burtt (Documentary)- Ben Burtt invites you into his office at Skysound, a laboratory of artifacts used to create the unforgettable SFX of Star Wars. Discover the inspiration for the sounds of C-3PO, R2-D2, the Lightsaber and the ominous breathing of Darth Vader. Classic Creatures: Return Of The Jedi (Documentary)- Go behind the scenes – and into the costumes – in this in-depth exploration of the painstaking techniques utilized by George Lucas to create the classic creatures and characters seen in the film. Hosted by Carrie Fisher and Billy Dee Williams. Revenge Of The Jedi Teaser Trailer- The teaser trailer for the originally titled Revenge of the Jedi. Return Of The Jedi Launch Trailer- The next epic chapter of the Star Wars saga continues with Return of the Jedi. It Began TV Spot- The Saga lives on with Return of the Jedi. Climactic Chapter TV Spot- Return of the Jedi, the climactic chapter of the Original Trilogy. Vader’s Arrival And Reaching Out To Luke (Deleted Scene)- This sequence nearly made it all the way to the finished edit of the film, as it was scored with music and features completed visual effects. It would have introduced Luke Skywalker very early in the movie, as well as his new lightsaber. Tatooine Sandstorm (Deleted Scene)- This was the first scene shot for Return of the Jedi, and also the first scene cut from the film. As it was never completed, the dialogue was never re-recorded. Battle Of Endor: The Lost Rebels (Deleted Scene)- This footage includes Rebel pilots who never made the final cut, plus additional action featuring the Millennium Falcon’s support crew. Footage of General Madine as the Rebel leader was shot in case the puppet of Admiral Ackbar did not look convincing. Jerjerrod’s Conflict (Deleted Scene)- Commander Jerjerrod originally had more screen time. He is seen risking the wrath of Vader, and having misgivings about targeting the Endor moon with the Death Star.